For dangerously underweight individuals like yourself, I recommend a slow, steady gorging process combined with assal horizontology. The bed is stained and finished, and still living on the porch. 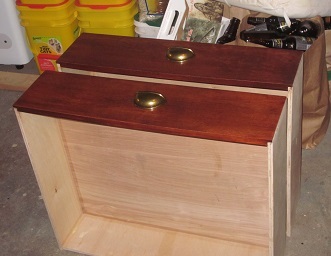 The drawers are done as well, and I’ve attached the pulls to the fronts. They are living in small groups in the basement. I used my gel stain procedure on the bed, and finished with two coats of a wipe-on poly from Minwax (in satin finish, so not too shiny). I also sanded the insides of the drawers and applied clear caulk around the interior joints to prevent splinters in clothing (never fun). 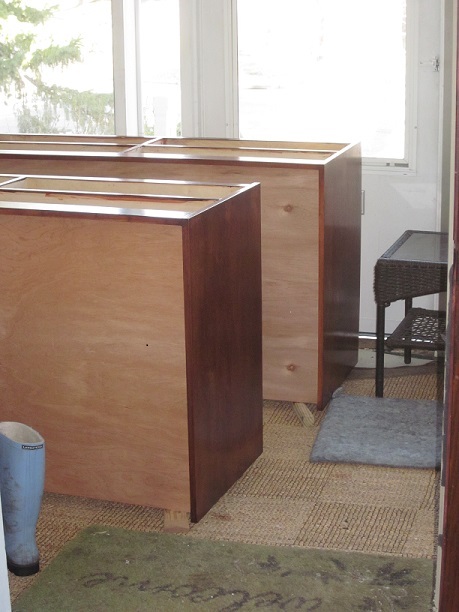 Next: finding a replacement mattress, fitting metal drawer glides and adding bolts to hold the two sides together. 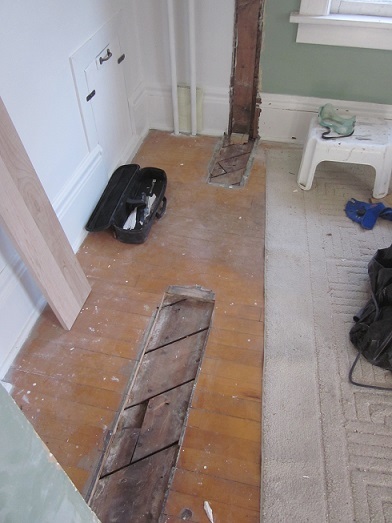 The Kev has been sawing away at the gaps in the floor and is about ready to put in the gap-filler floorboards. Can you tell where the door was? 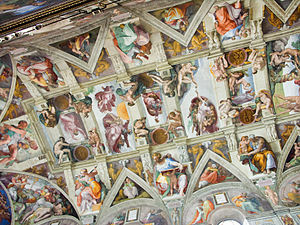 “Like the Sistine Chapel restoration?” I queried. Biggest art restoration of the 20th century on the one hand…our bedroom floor on the other! Next: attaching new floorboards and sanding/refinishing the whole dang floor. The doors arrived and I bought some knobs for ’em. They’re living in a corner of the dining room. Next: pretty much everything having to do with that. 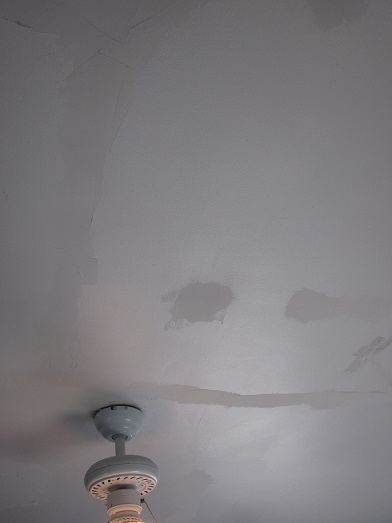 I’ve touched up the plaster on the ceiling and walls using joint compound, but I haven’t sanded that work flat yet. Ceiling plaster patches awaiting sanding. Is it just me who sees a sad clown face in this picture? The walls are going to take some additional work beyond the basic hole-patching, especially under the windows, so I’m going to sand everything at once when those areas are ready to go. 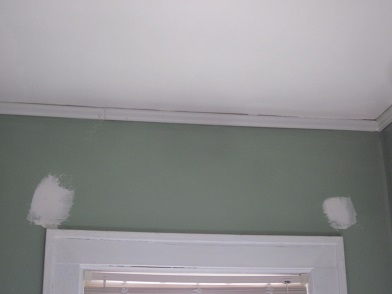 Next: patching wall issues, sanding, priming, painting, installing moulding. And painting that. Of course, there are other lists, with their own sublists, but let’s focus on the positive. I bought a vintage etched mirror for the wall! And a storage ottoman for the vanity table! So I appear to believe we’ll be done some day. Progress! Maybe we’ll be back in there this year. I’d welcome words of encouragement if you’ve been there and reached the other side. This entry was posted in Construction, Walls & Floors, Windows & Doors and tagged bedroom remodel. Bookmark the permalink.